This month, The Weekend Gourmet Dines Out spotlight is shining on Francesca's at Sunset, located inside the acclaimed Westin La Cantera Hill Country Resort. This AAA Four-Diamond Award restaurant features "farm to table" Southwest cuisine from locally sourced ingredients, along with stunning Hill Country views. 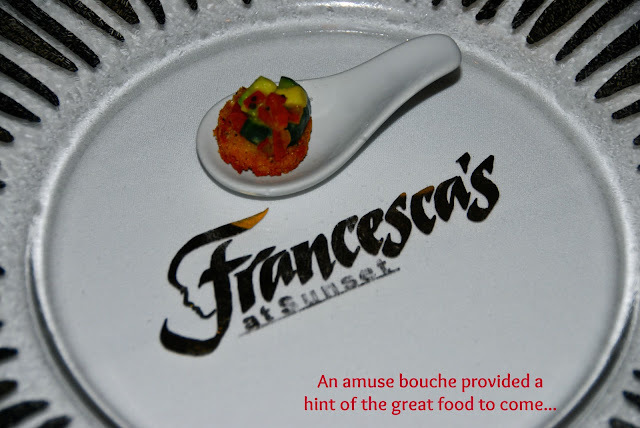 We were recently invited to come for dinner to try some of their signature menu items. Since we're focusing on Texas products this month, we also enjoyed hand-selected wine flights from Texas wineries with our dinner. We were immediately impressed with the beautiful decor...and the beautiful night view from our table. The restaurant is located on the third floor of the resort, so you have a bird's eye view of the grounds and the surrounding Hill Country. I can only imagine how stunning the sunset views must be during Summer months! We were warmly welcomed by the staff and quickly shown to our seats. We were then served a lovely amuse bouche, and Resort Sommelier Steven Krueger poured us a glass of Becker Vineyards' refreshing 2011 Provencal wine. 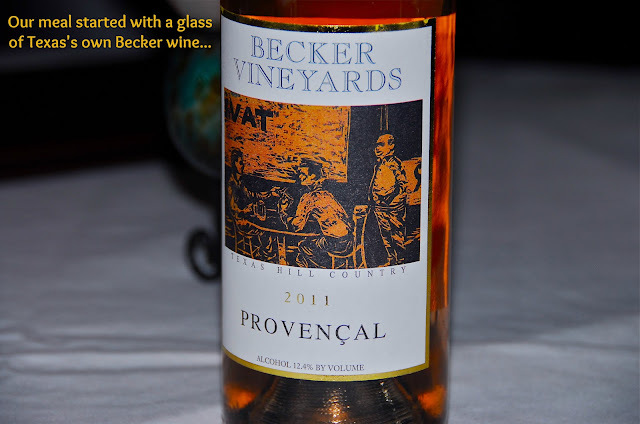 The Provencal was a light and fruity rose. It was so refreshing! We looked over the menu and were impressed with the array of offerings. We started with two appetizers. Michael ordered the Seared Scallops a l'orange, while I opted for a chilled Cucumber Avocado Soup. 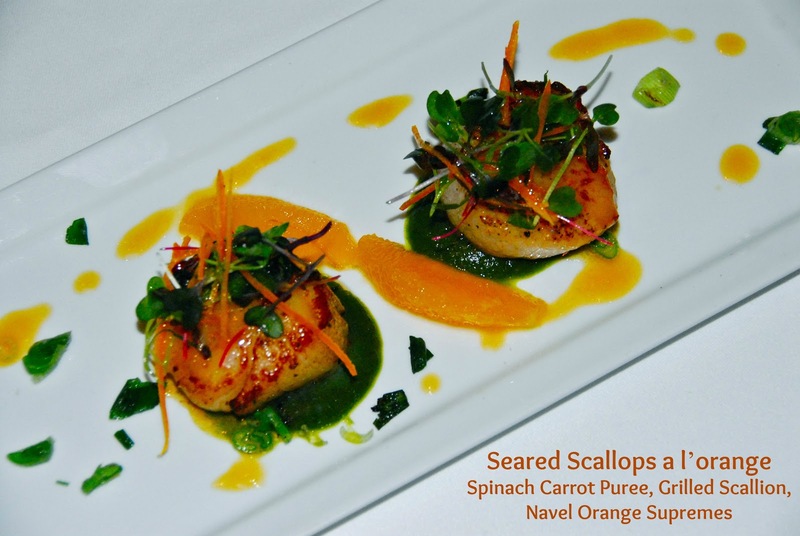 Michael isn't normally a huge scallop fan, but he loved these! They were perfectly cooked, and the tangy citrus sauce worked perfectly with them. My soup was creamy and full of Spring flavor. The first flavor I tasted was the creamy avocado, then the subtle cucumber. 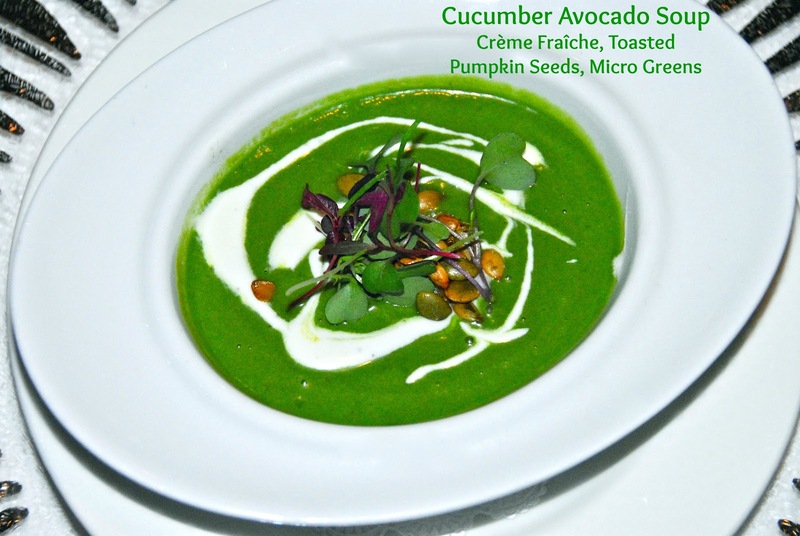 It was really nice, and the pumpkin seeds and micro greens provided a textural contrast. 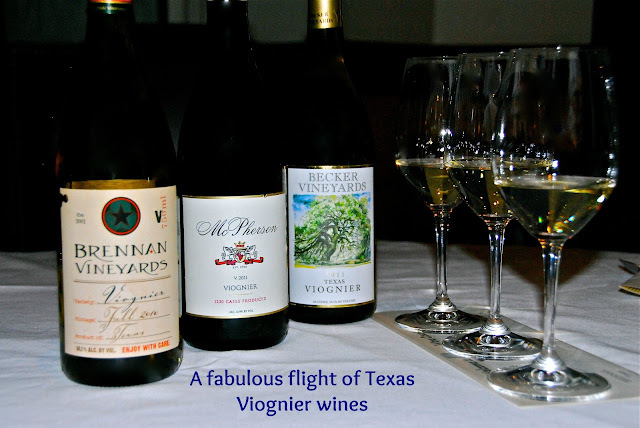 Our first Texas wine flight arrived with the appetizers. This was a flight of Texas Viognier. These award-winning white wines are from Brennan Vineyards, McPherson Cellars, and Becker Vineyards. All three were crisp and easy to drink, and they paired perfectly with the flavors in our appetizers. Mr. Krueger was so knowledgable, educating us about Texas winemaking over the course of the evening. While we sipped our wines, we looked over the salad portion of the menu. When our server noticed we had time picking two of the three, he had a brilliant solution...the chef would make us petite versions of all three salads so we could try them all! All three were bursting with flavors and textures. The Seasonal House Salad featured field greens, an apple chip, candied pecans, creamy mild goat cheese, and heirloom cherry tomato...all tossed in a tangy raspberry vinaigrette. 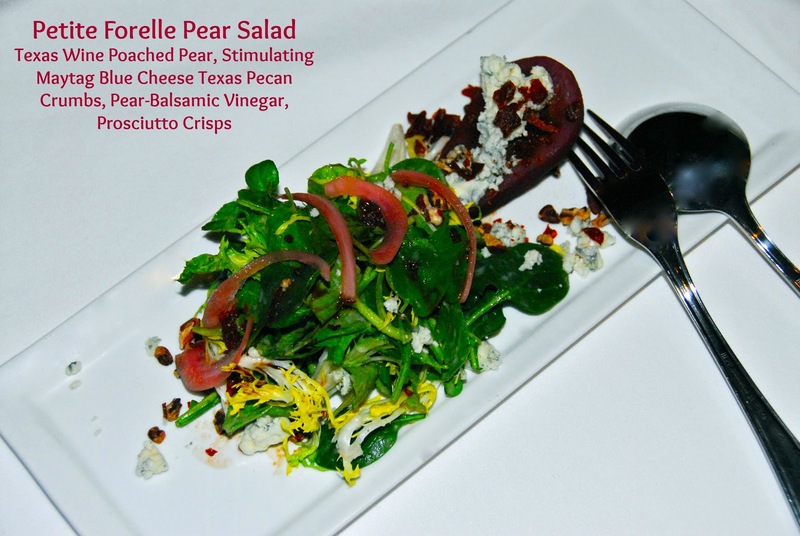 The Forelle Pear Salad featured a wine poached in Texas red wine, sharp Maytag blue cheese, pecans, crispy prosciutto, and a pear-balsamic vinegar. 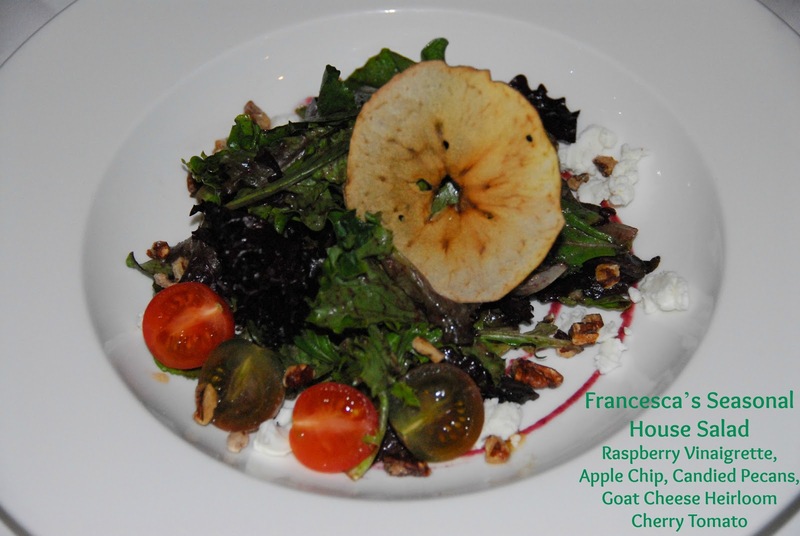 This salad was a fantastic combination of sweet, savory, and tangy. 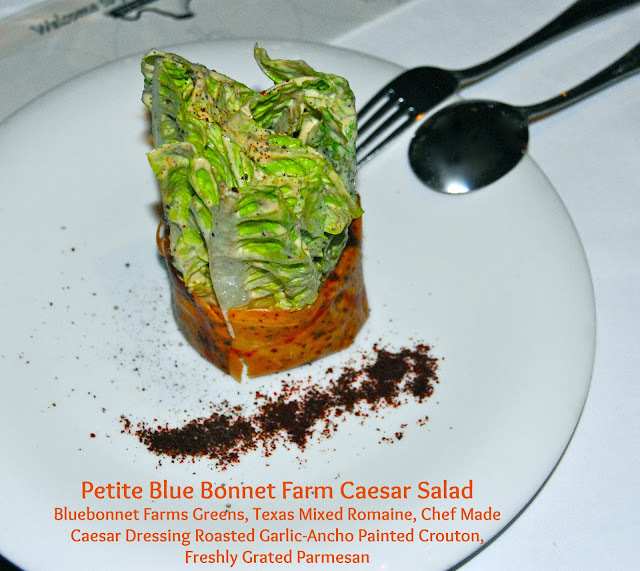 The final salad was a mini Blue Bonnet Farm Caesar. 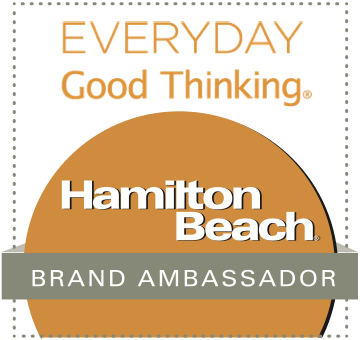 This amped-up Caesar features house-made dressing, a crispy garlic-ancho crouton, and parmesan. This spicy take on a classic Caesar was amazingly delicious, and we loved the unique presentation. No matter which one a diner chooses, they won't go wrong! The salad plates were cleared, and we were eagerly anticipating our entrees...when Chef Stephen Gonzalez appeared from the kitchen to say hello and bring us a surprise bonus course: house-made pork pate with cornichon, grainy mustard, balsamic reduction, and crisp crostini. This was something we likely wouldn't have picked if we'd seen it on the menu, but we absolutely loved it! 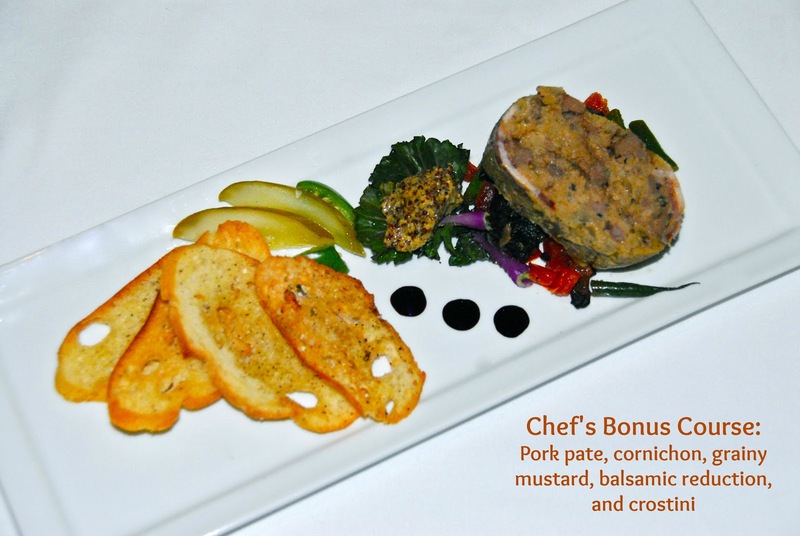 The pate was flavorful, with a nice texture. When spread on the crostini with a bit of each condiment, it was a flavor explosion in our mouths. Chef Gonzalez is a very talented chef, and we enjoyed having a few minutes to chat with him to personally thank him for such an amazing meal. As our entrees were being plated, Mr. Krueger brought out a flight of Texas red Tempranillo wines. 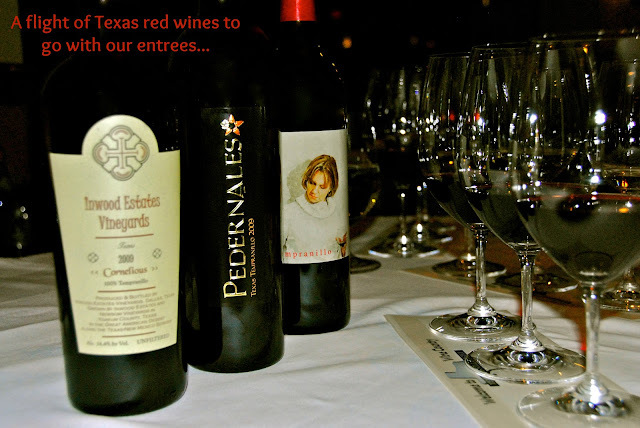 These wines came from Inwood Estates Vineyards, Pedernales Cellars, and Red Caboose Winery. If you've never had this full-bodied and fruity ruby red wine, I'd encourage you to seek it out. 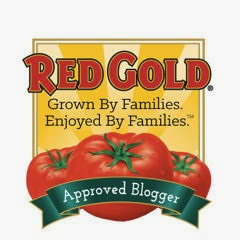 We loved it, and it paired really well with our entrees! Our entrees arrived shortly after the wine was poured, along with a bonus entree selected by Chef Stephen. 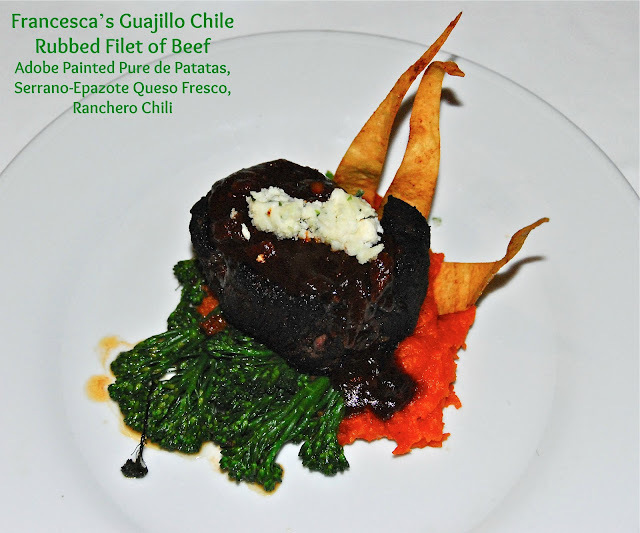 Michael loves steak, so he opted for the spicy Guajillo Chile Rubbed Filet of Beef. 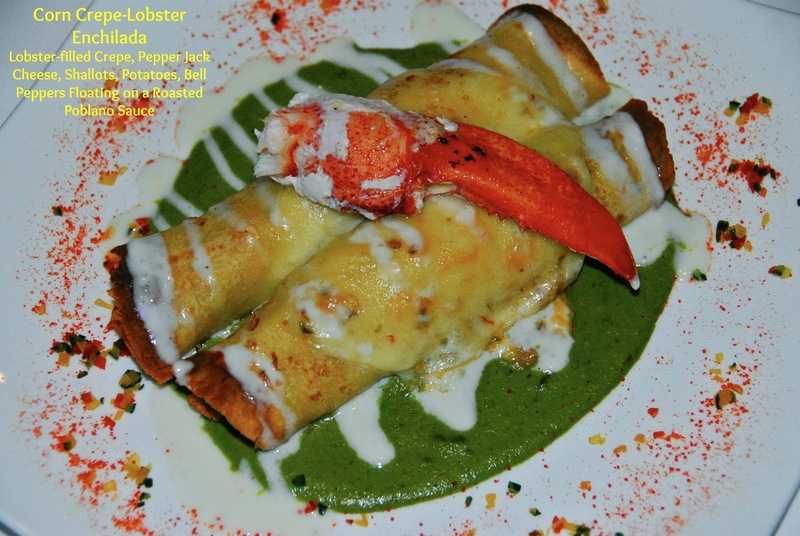 I can't pass up lobster, so I immediately knew that the Corn Crepe-Lobster Enchilada was perfect for me. 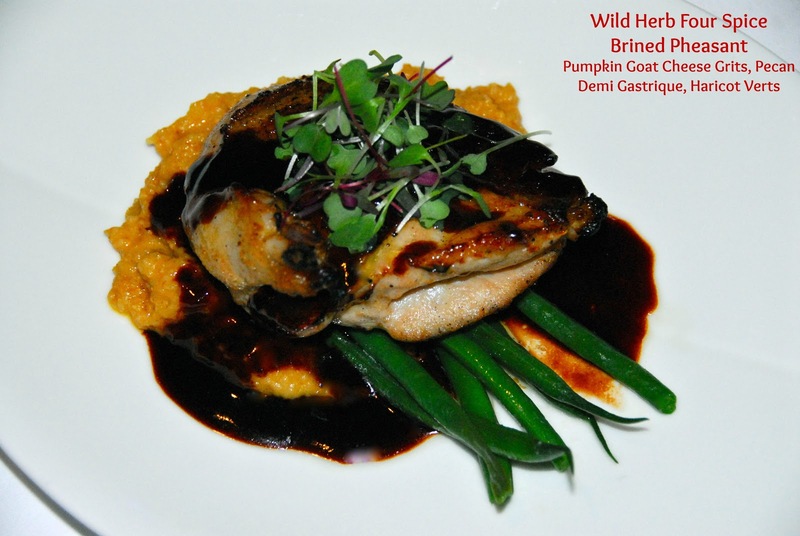 Chef Stephen's selection was the Wild Herb Four Spice Brined Pheasant, served with creamy pumpkin goat cheese grits and hericot verts. All three of the entrees were expertly prepared and beautifully presented. 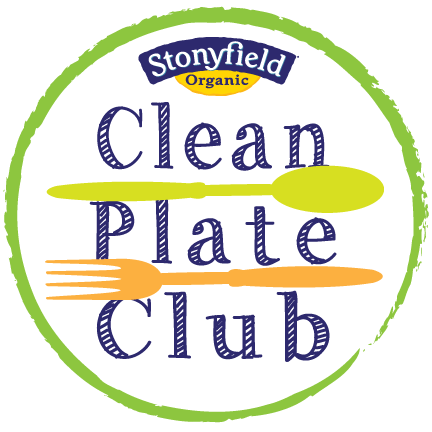 The steak was cooked perfectly, the enchiladas were complex and just spicy enough, and the pheasant? It was fantastic! It was juicy and well-seasoned, and the creamy grits paired perfectly with it. After our plates were cleared, we looked over the dessert menu and enjoyed one more glass of wine. 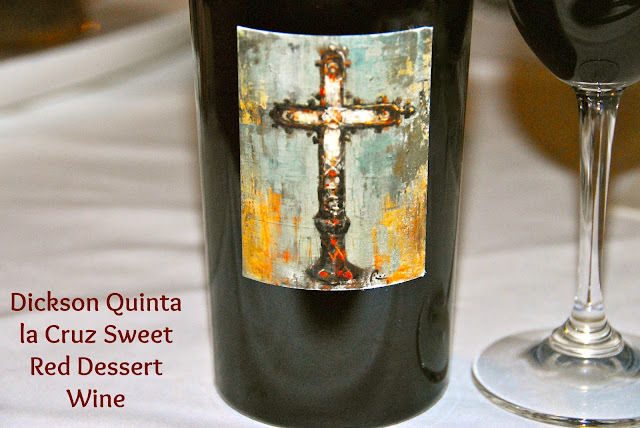 Dickson's Quinta La Cruz is a fortified sweet red dessert wine similar to port. It was stunning...sweet and complex. It matched really nicely with the two desserts we selected. 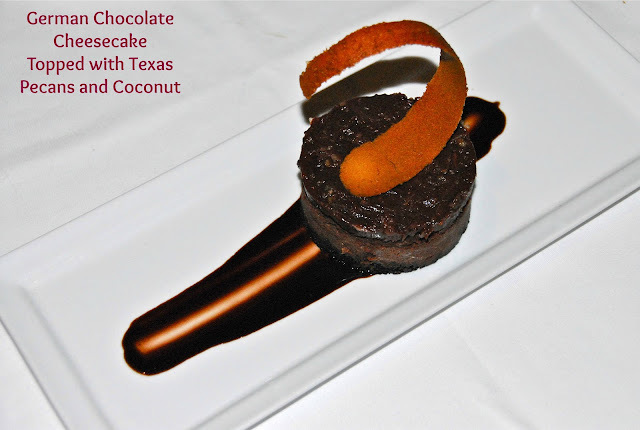 Michael picked the German Chocolate Cheesecake topped with Texas pecans and coconut. It was rich, but not overly so. I opted for the Chocolate Lava Doughnut with Kahlua Mousse and Coffee Chip Ice Cream. 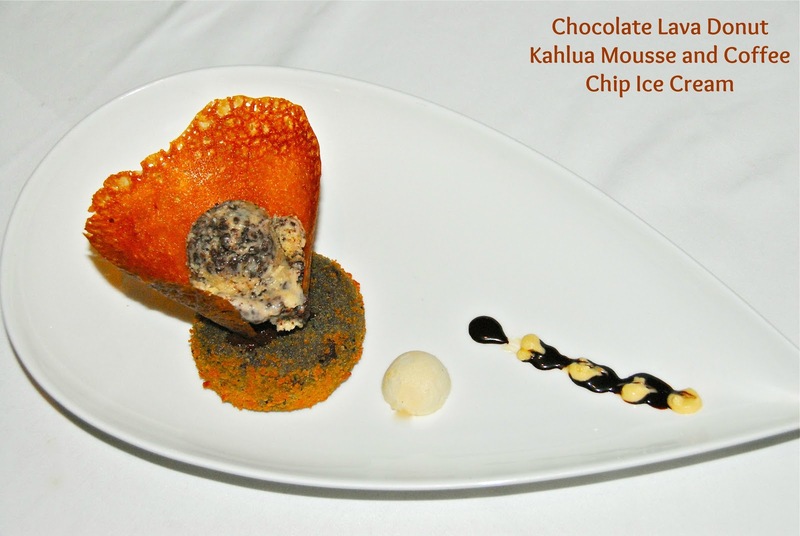 The mocha flavor was subtle, and the lava cake was warm and gooey on the inside. When combined with the cold ice cream and creamy mousse, it was the perfect combination of flavor and texture. The portion size of both desserts was perfect after our large meal. It was the perfect sweet ending to our meal. Francesca's at Sunset is an amazing restaurant -- fantastic food, an amazing selection of wines, and attentive service. 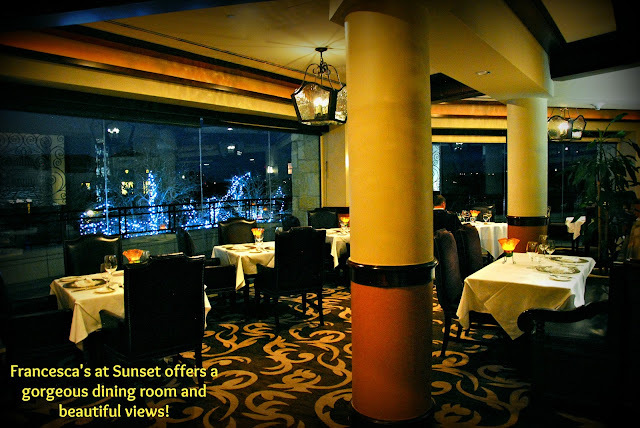 Add in the romantic setting and amazing views, and it gets my vote as one of the most romantic special-occasion restaurants in San Antonio. 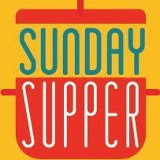 Francesca's at Sunset is open for dinner nightly from 600-1000 p.m. To make reservations, you can visit their website. 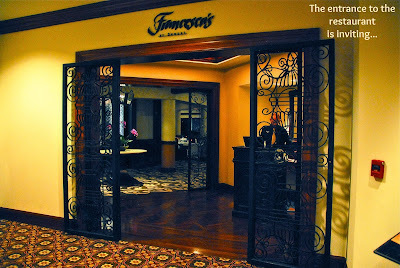 Disclosure: Francesca's at Sunset provided us with complimentary dinner and wine pairings to facilitate this article. All opinions expressed are my own, and all photographs are copyright 2013 by Michael K. Garcia. Pictures may not be copied/reproduced without permission.